Today is the anniversary of the death of the last man to be executed on Governors Island. 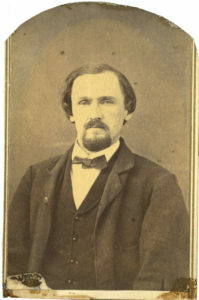 On this date, February 24, 1865, Confederate Captain John Yates Beall was hanged for capturing two Union ships. The story was front-page news across the nation, and led to conspiracy theories around the death of President Lincoln, ghost stories, and urban legends. John Beall. Courtesy of The Museum of the Confederacy. Beall was a Virginian who fought for the South. During the war he slipped into the North and worked as a spy on clandestine missions. He took on a role as a member of the Confederate Navy, and undertook a plot against the Union. He and raiders were captured after interrupting supply lines and seizing a merchant ship in the Chesapeake Bay. Beall was returned to Richmond in a prisoner swap. He went back into action, and back North, with a new plot to free Confederate prisoners of war, derail passenger trains, and seize Union ships. On December 16, 1864, he was captured at Niagara Falls and brought to New York City. His last words were, “I protest against this execution. It is absolute murder—brutal murder. I die in the service and defense of my country.” He was 30 years old. After internment in Green-Wood Cemetery in Brooklyn for five years, his remains were brought home. Today John Y. Beall is buried in the Zion Episcopal Church graveyard in Charles Town, West Virginia. The New York Post related a story in 1912 about the execution. It said the “tragic part” of the day was that Beall and the U.S. Army commander in charge of the prison had been schoolmates. A few days before the execution, a man who had been in class with both the prisoner and commander asked if he could be granted permission to spend the night in the cell with Beall. He was allowed, as long as he didn’t help his friend with “means of cheating the gallows.” When Beall was told this, he smiled and said to his friend, “After I have been hanged, I want you to look in my left shoe. You will find then that there was no need for you to give this promise or for the commander to require it.” Following his death, inside Beall’s sole was found a sharpened piece of watch spring, which he could have used to commit suicide. Amid some expressions of surprise and mild incredulity, Mr. Pomeroy told the following story, prefacing it by the statement that it had never been published. There is also a legend that Beall’s ghost haunts Castle Williams. In an 1890 newspaper account in the New York World, it’s said that his ghost has been spotted walking around the parapets of the fort.